A crusading Mexican-American journalist searches for justice and hope in an increasingly violent Mexico In the last decade, more than 100,000 people have been killed or disappeared in the Mexican drug war, and drug trafficking there is a multibillion-dollar business. In a country where the powerful are rarely scrutinized, noted Mexican-American journalist Alfredo Corchado refuses to shrink from reporting on government corruption, murders in Juárez, or the ruthless drug cartels of Mexico. One night, Corchado received a tip that he could be the next target of the Zetas, a violent paramilitary group--and that he had twenty-four hours to find out if the threat was true. Midnight in Mexico is the story of one man's quest to report the truth of his country--as he races to save his own life. Praise for Alfredo Corchado's Midnight in Mexico "Electrifying... the portrait that Corcahdo paints is all the more heartrending for Mexico's extraordinary promise... Security and the drug war that are Mexico's biggest worries... watching Corchado struggle in the crucible, trying to do the right thing by his two homelands, one can't help being reminded... the dawn that will follow this 'midnight in Mexico' will come only if we take some of the responsibility. The health of this neighbor is integral to our own." --Washington Post "Corchado looks at Mexico's darkest hour. And doesn't blink." --Alan Cheuse, Dallas Morning News "A riveting account that features many of the places and personalities that have been central to Mexico's recent nightmare...Corchado is a dogged and savvy journalist who manages to be everywhere a good reported should be... A unique binational perspective on the two countries he calls home, expressing admiration for the determination of U.S. and Mexican officials to fight a shared problem by taking on shared responsibility." --San Francisco Chronicle "[Corchado's] solid research and detailed understanding of the forces at work there make the book an important one for anyone who cares about Mexico, and his personal struggle with his homeland make it a raw, compelling read." --Miami Herald "The secret revealed at [Midnight in Mexico's] conclusion is more compelling than Citizen Kane's 'Rosebud'... I won't spoil the ending here, but you will shiver when you get there, and you may even weep. Either way, you will understand Corchado's need to stay in Mexico and his need to bring us stories that we need to read." --Texas Observer "An excellent, first-hand description of what a journalist must endure to report critically on Mexico." "Having lived and reported through four presidencies... His own story is emblematic... People are willing to do anything about Latin America other than read about it, or so it's been said. This is one book about Latin America that merits attention." --Kirkus "This book is about the blood-drenched borderlands that divide Alfredo Corchado's two countries, Mexico and the United States, which still dominate his own life. Told against the backdrop of the horrifically violent drug wars that have turned much of Mexico into a charnel land, Corchado shares his own story and that of his family with a moving degree of honesty and acuity. Corchado's love for his immigrant family and pride in what they have achieved is palpable, yet weighted down by a sense of what they, and Mexico, may have lost forever in the exchange. In many ways, Midnight in Mexico stands as a raw, real-life parable for the paradoxes of the Mexican-American experience, and it is both a riveting and gut-wrenching read." 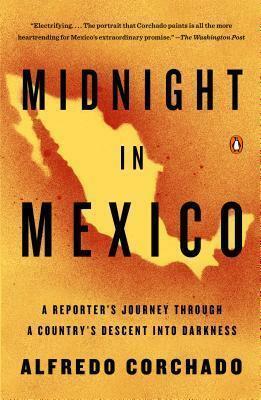 --Jon Lee Anderson, author of Che Guevara: A Revolutionary Life and The Fall of Baghdad "Midnight in Mexico is the story of a journalist's dangerous and notable efforts to report on Mexico's horrible drug wars. The book brings a special clarity, the clarity of the personal and particular, to a very important and confusing subject, and it is in itself an absorbing story, marked by careful attention to fact and also by the author's deep love for his homeland. Mr. Corchado is the kind of reporter and writer who revives one's faith in journalism." --Tracy Kidder, Pulitzer Prize winning author of Strength in What Remains "Anyone who wants to learn about Mexico on the inside, especially how the United States affects it, illegally and legally, will learn much from this sharply perceptive and moving account." --John Womack Jr., Robert Woods Bliss Professor of Latin American History and Economics, Harvard University "Alfredo Corchado is the top American journalist covering Mexico today. His life embodies the complex blending of the U.S. and Mexico. Corchado's knowledge of the Mexican political system, the drug trade, and modern Mexican society is non-pareil." --Howard Campbell, author of Drug War Zone "One of the keenest observers of Mexico today, Corchado tells his story of Mexico, of the hope of its democratic opening, of the often despair at its violence, and of its ever closer ties with his other country, the United States." --Shannon K. O'Neill, Senior Fellow for Latin American Studies, Council on Foreign Relations "Anyone interested in what is happening and has happened in Mexico for the past six years must read this book. We can call what is happening in Mexico a "drug war" but that phrase cheapens the politics and the economics that govern the relationship between the United States and Mexico. I believe Midnight in Mexico will become one of the most necessary books about the Mexican-American experience in this country. More than a journalist, Alfredo Corchado is the real thing, a voice that represents millions of people." Alfredo Corchado is a Nieman, Woodrow Wilson, and Rockefeller fellow and the Mexico bureau chief of the Dallas Morning News. In 2000, he was the first reporter granted an interview with then newly-elected president Vicente Fox. He lives in Mexico City.